Hundreds of service personnel from Devon and Cornwall will see active service in Afghanistan in the spring, the Ministry of Defence has announced. Among the hundreds of South West personnel deploying to Afghanistan will be 45 Territorial Army soldiers from Exeter-based 6 Rifles. Although they are being mobilised along with the regular troops these men and women have effectively volunteered to go to Afghanistan. Among them is Ted Evans, a 32-year-old doctor in the accident and emergency department at the Royal Devon and Exeter Hospital. He is also 6 Rifles' Regimental Medical Officer. He has been to Afghanistan before, but is keen to get out there again. He said: "It's an important job to be able to support your boys and I feel the soldiers at 6 Rifles are my boys. "Seeing them train hard and work hard towards this upcoming tour of Afghanistan inspired me to get involved and help them out. "I look forward to the opportunity to practice medicine in a difficult environment with new challenges, new responsibilities and to really feel part of something that is making history. "To be involved in that process is a daunting one, but it's also exciting." There has been a shift in the way the Army views its reservists these days. They are not there just to make up the numbers, there is an acceptance that they can bring skills from their everyday lives that regular soldiers may not have. Dr Evans is an obvious example. "I'm lucky that my transition from my civilian job to my military job is essentially the same," he said. "I'll be looking after a very different population of patients, but essentially my skills are immediately transferable. "My main focus will be to make sure other soldiers, civilians and even enemy fighters are well looked after if they are injured. "But I'm also there to make sure that we can maintain the fighting strength of the soldier, so I'm acting to look after them on a day to day basis, from simple complaints and minor injuries all the way up to significant battle wounds." But he says he can also bring valuable knowledge back from Afghanistan. "In Afghanistan we see significant injuries, be they from battle, from accidents, or whatever it may be and that experience can only help me in my clinical practice here in Exeter." Dr Evans said his family were aware of the dangers, but were very supportive. "I have a brother who has just returned from Afghanistan," he said. "He's an infantry commander with the Ghurkas and he's come back full of exciting stories and inspiring tales. Mum and Dad understand that it's something we've always wanted to do." Also vital for TA soldiers to be able to do their job, is having the support of their civilian employer. Dr Evans said he was lucky. 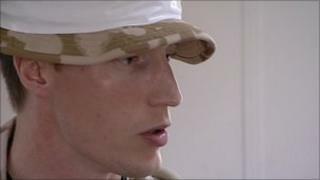 "The NHS are fully supportive of the Territorial Army and they fully appreciate there's a job to be done," he said. "Although my services are needed in this department, especially during this busy time of the year, they understand I've also got a job to do somewhere else." Most of the soldiers from 6 Rifles will enjoy a spell of well-earned leave over the festive period - but not Dr Evans. "I'm committed to a period of work here in the department. Over Christmas we'll be extremely busy I'm sure, but that's good preparation for the tour," he said.